A good story after long period. Finished it just yesterday. Chetan's style of writing is simple, convincing and crude at times. The story of 3 friends, from three different thinking styles, three different interests, committed for friendship and common cause. Chetan has been able to take the youth along all through the story by keeping the reader always thinking what-next. A sense of entrepreneurship is projected very nicely and the reader would certainly like the way marketing and strategic concepts are shown practiced by the Govind and others. In India nothing catches better eye than Cricket, Religion and Politics and this has been portrayed authoritatively through this story. 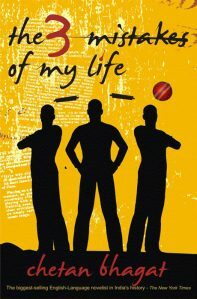 The plot is woven in Ahmdabad, and the whole story surrounds the ambitions of three young friends, one who is very responsible and wants to earn money, another one whose dream of playing for indian cricket team fails, so he wants to see his pupil, Ali, achieving that, and the third one just joining these two friends in their ventures and journey. The story seems little weak towards the end, specially when the three friends come back from Australia and get busy in their personal ambitions. The author has been successful in putting lot of masala in the book which keeps the reader attached to the book. The language and style is easy to follow and adds to the hyphenated glossary. Chetan shows remarkable understanding of Indians, specially youth and through this work has been able to assert in a manner much better than many other authors. Keep it up.